« A perfect, ironic circle. Or, maybe it’s just the caffeine. Here’s a shot of what Lincoln Street in the Leather District looked like today. Earlier it was Christmas time on South Street. What’s the occasion? The crew was filming Ghosts of Girlfriends Past with Matthew Mconaghey, Jennifer Garner, Michael Douglas, Anne Archer. 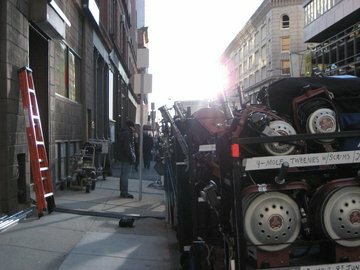 It’s Hollywood in Boston, just like I predicted, Not! Of course, you won’t hold it against me will you? I wrote for Boxoffice.com that Boston was not likely to become Hollywood North, just last month. Happily, it looks like I was at least premature in my predictions that production companies would move to the next cheapest location. I did stop this afternoon and offer my help to the crew who might be looking for a good lunch spot. If you can’t ask the Leather District Gourmet for advice on good chow here, who can you ask?